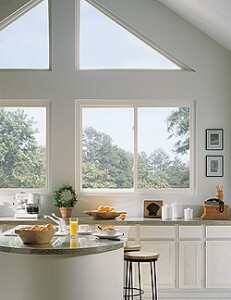 Architectural windows give your home or commercial building a modern take on classic window styles. The home improvement experts from Shiner Roofing, Siding and Windows take great pride in helping our customers find exactly the right match for their personal visions of how their windows ought to look. As a family- and locally-owned contractor, Shiner is committed to helping our neighbors in Washington, D.C. and elsewhere in the Northern Virginia and Maryland region create exactly the sort of living spaces of workplaces they envision. The architectural windows installed by Shiner are ENERGY STAR® certified in all 50 states, and are available with optional insulated, soft-coat Low-E glass for even greater savings on energy costs. Our design specialists also can recommend a variety of woodgrain finishes to match your home’s interior. Shiner is a licensed, bonded, and insured home improvement contractor in Virginia, Maryland and the District of Columbia. We have completed more than 16,000 home improvement projects in the Northern Virginia-Maryland region since our founding in 1981. Contact us today to schedule an on-site design consultation or request a quote on architectural windows in Fredericksburg, VA, Alexandria, Gaithersburg, MD, or anyplace else in the Washington, D.C. area.